Citrus College awards honorary diplomas to Nisei. GLENDORA — As a 17-year-old halfback for Monrovia High School, famed Nisei athlete Tosh Asano once grabbed hold of the football and ran back 99 yards for a touchdown against the Covina Colts. 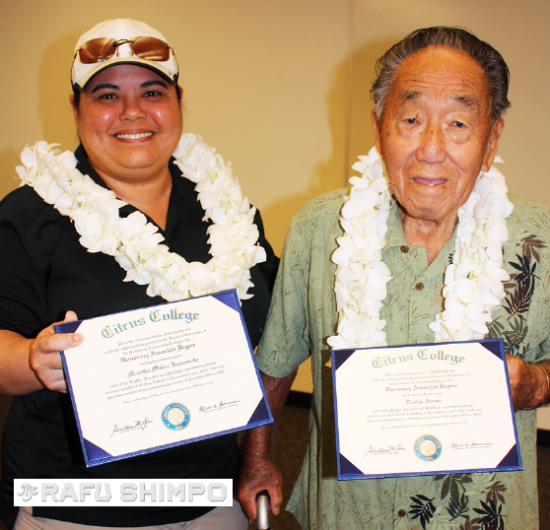 Last Wednesday, Asano, now 91, picked up something that had eluded him for over 70 years: a college diploma. Citrus College, celebrating its centennial anniversary, conferred honorary associate of arts degrees upon Asano and the late Masako Mukai Kusumoto. Both were first-year students at Citrus when World War II broke out and they were unable to finish their studies due to the forced evacuation of Japanese Americans from the West Coast. Wearing a white flower lei, Asano easily took the handoff from Dr. Patricia Rasmussen, president of the Citrus College Board of Trustees. At Citrus, Asano starred on the varsity football team, scoring 103 points to lead the nation in junior college scoring. He was named to the All Southern California Junior College second team and was looking forward to the 1942 season when Japan attacked Pearl Harbor on Dec. 7, 1941. Asano was enrolled in seven classes before he was forced to end his studies at Citrus on March 27, 1942. Asano’s family was first sent to the Pomona Assembly Center and then to the Heart Mountain internment camp in Wyoming. While at Heart Mountain, Asano was drafted in 1942 and became an interpreter for the U.S. Army, serving in the Philippines and Japan. The Army recognized his athleticism and Asano played softball in the Army Olympics. Upon his discharge from the Army in 1945, he returned to Monrovia. He continued to play softball for the next 20 years, played semi-pro baseball with the Little Tokyo Giants, and later pitched in a softball industrial league until his early 50s. He worked for MidWay Ford until he retired. Asano married in 1949 and has two daughters. In June 2012, Asano received the Congressional Gold Medal at the regional Congressional Gold Medal celebration in Little Tokyo for his service in the Military Intelligence Service. Accepting on behalf of Mukai Kusumoto was Kayle Matsushima, her grandniece, who traveled from Wailuku, Maui, with her mom, Annette Matsushima, a retired teacher, to participate in the ceremony. A copy of Mukai Kusumoto’s permanent record was on display at the ceremony held at the Citrus College Center for Innovation. In 1943, she attended Iowa State Teachers College, now University of Northern Iowa, in Cedar Rapids, Iowa, before returning to Hawaii in 1945. Upon her return to Maui, she taught school on a sugar plantation in the neighborhood she grew up in. She later specialized in reading and taught grade school. Mukai Kusumoto passed away in 1980 in Wailuku. Although she didn’t have children of her own, she influenced many of her nieces and nephews to pursue teaching. Several of them even attended Iowa State Teachers College from Maui. 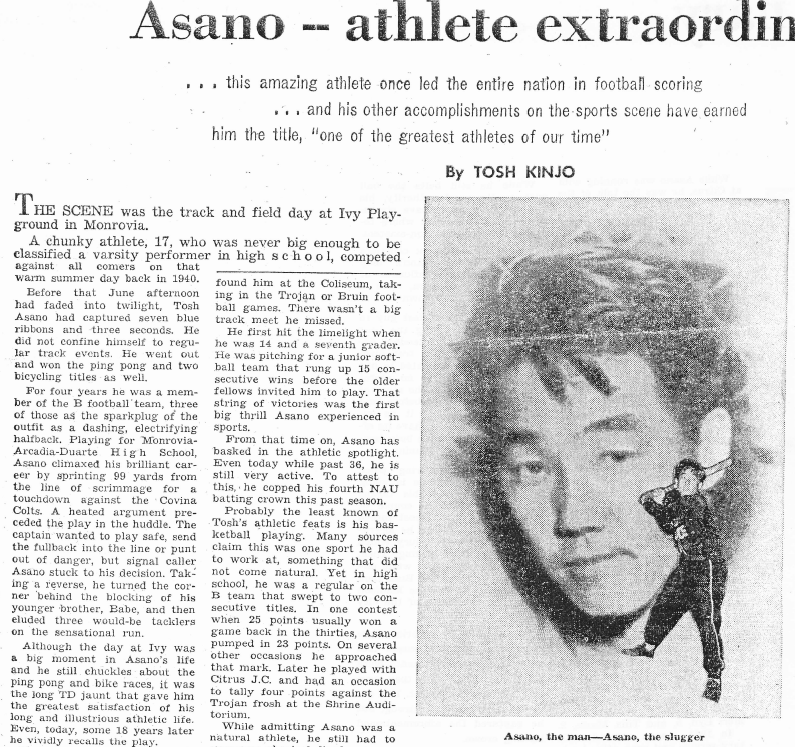 Part of a 1958 Rafu Shimpo article about Tosh Asano by Tosh Kinjo.